Their engaging melodies and lyrics set to the infectious rhythms of Calypso, Reggae, Zouk, and Soca, and highlighted with the indigenous sound of steel drums or steelpans, will take you on a virtual Caribbean vacation. 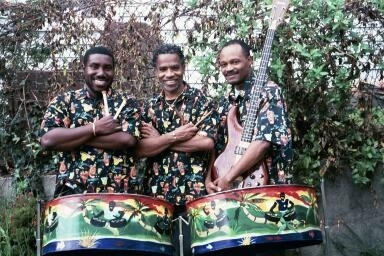 Based in the San Francisco Bay Area, these steel pan players have been the darlings of the corporate party scene in Northern California, Tahoe and Reno for more than a decade. You'll be happy you did too when your guests pay you the highest compliments for your choice in music. Shabang is the perfect addition to your Caribbean or tropical theme party.